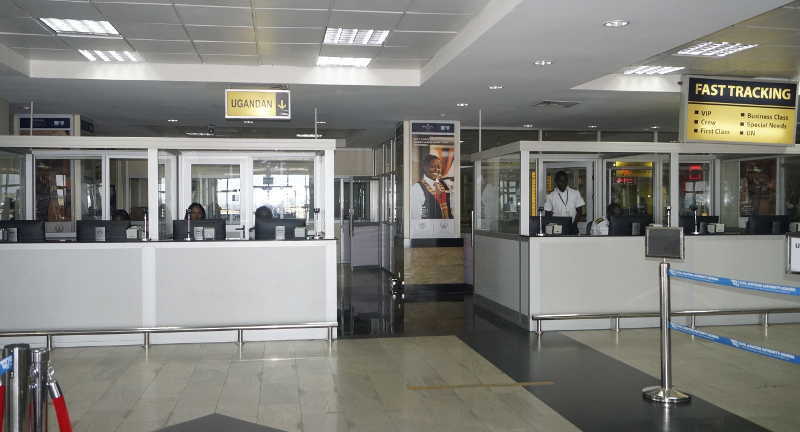 A long flight back home in Uganda at Entebbe International Airport has sometimes come across as less exciting, or outrightly annoying for some passengers due to lengthy queues they find at the arrival’s counters. This however may be about to change following the installation of new counters at the arrivals terminal. CAA says that they have increased the number of arrivals counters from 14 to 20. The move is aimed at enhancing efficiency and reduce on the long lines previously encountered. Some of the new immigration booths installed are each manned by four people and others three instead of two, which was the case with the old arrangement. In addition to the above expansions, the contractor China Nanjing, introduced a fast-tracking lane by dedicating one of the counters to cater specifically for passengers with special needs; i.e First class passengers, Business Class, Flight Crew among others. CAA says that the contractor’s next step job is to modify the immigration counters at the Departures terminal to increase their number and further enhance service delivery. However, the experience of Commercial Banks which still experience long lines despite having installed many counters, means that the authorities will have to walk their talk on increasing efficiency. 2018 a year of Economic revival?